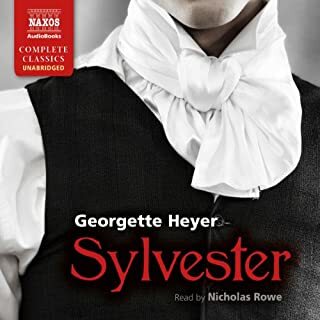 ©1999 Georgette Heyer (P)2014 Audible, Inc.
One of the few Georgette Heyer novels I haven’t read. It just never took my fancy. Phyllis Nash breathed life into it and I enjoyed the story line. I would love her to narrate ALL the Georgette Heyer books. What did you like most about The Talisman Ring? I liked most the wit and fast-paced action of this story. There was a delightful deftness in the twists and turns of plot, and the characters were both credible and fantastic at the same time. I loved the witty dialogue and the way in which the mystery was gradually revealed, leading up to a very satisfactory happy ending. My favourite scene was when the cross-dressing hero managed to evade capture. It was, and I did! This narrator was brilliant. Her characterisations spot on, her narration spiked with all the irony and subtlety of the prose, and her voice very pleasing to the ear. Perhaps not one of Heyer's more well-known novels, but a light-hearted romp through Georgian England which I found enjoyable and satisfying. 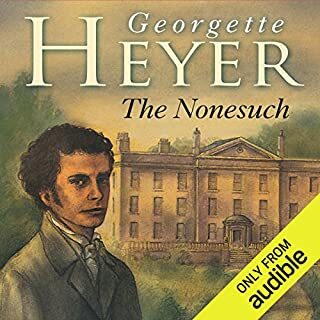 I am a very devoted Heyer fan, but I really struggled with this novel until I heard Phyllida Nash's narration. Now it is genuinely my favourite listen! Funny charming and romantic. what an adventure! Although somewhat shorter than many of her other novels. Heyer's Talisman Ring is one of her most entertaining reads. When I first read it years ago I thought how good a play it would make. Now, many years on, my very much thumbed and ragged version of the book has been replaced with an Audible version of the book delightfully read by Phyllida Nash - and yes, it does play very well as an audiobook. Snappy and funny dialogue of extremely likeable characters in a gently adventurous situation, this is a book that is fun to read and fun to listen to for anyone who enjoys lighthearted, well-scripted, regency romances. This is just a delightful novel, the characters so endearingly funny and the plot twists and turns. I am in awe of Phillida Nash's skill in giving us so many distinct voices from young to older, french and english. She enhances and enlivens what is already a great tale. 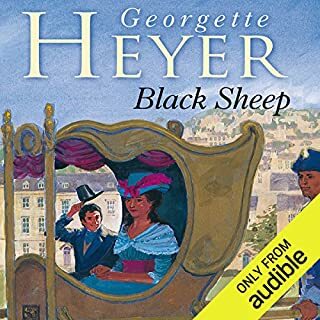 As an longtime avid fan of Georgette Heyer, I have read most of her books in print. For some unremembered reason, THE TALISMAN RING ranked relatively low compared to most of her others. However, I am such an enthusiast of Pyllida Nash's other Heyer readings that I gave it a try~~and I don't let go of my credits lightly. Surprisingly, THE TALISMAN RING has turned out to be now one of my favorites; the author certainly gets her due for her appealing characters and ever-scintillating dialogue, yet for me the book was transformed by the superlative reading by Phyllida Nash--she is the kind of narrator that Georgette Heyer deseves, but does not always get through Audible's choice of readers for these books. I have said it before, and will say it again: Phyllida Nash and Sian Phillips are far and away the best readers for the Heyer collection~~they have the intelligence and innate sensitivity to understand and portray the flavor of the Regency period; unfortunately, all the examples of male readers for these books seem not to have the remotest idea of the intricacies and implications of the society they are describing. 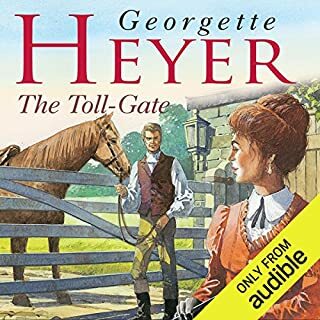 Audible could do us all a great favor and have the two narrators mentioned above re-record every Heyer book they have not previously read. I would buy them all; sadly at present I am limited to just a few. I hope someone who makes these decisions is reading this review! Excellent mystery romp! One of Heyer's best! Phyllida Nash brings this story to life far beyond the usual excellence of Heyer's sparkling dialog, quick-paced plot, and engaging characters. What a perfect reader for Heyer's prose! 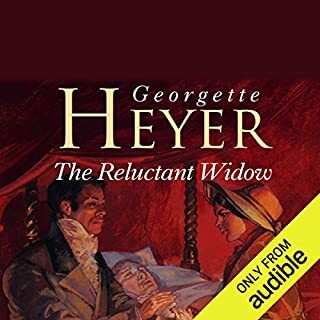 Reading Georgette Heyer books is perfect for those of us who have tired of too many bloody thrillers, depressing stories about personal discovery, tortured lives and redemption. Heyer books are perhaps for slightly advanced age group with hundreds of titles and topics covered over the years. In Heyer books like this one, the reader will find a clever story, well-researched historical language, plenty of humorous moments and enough plot to keep interest up. Simply enjoyable! This is my third by this author in the last 2 weeks, it's addictive. This narrator really did an excellent job with each voice, so the dialog was even better. The french accent was great, loved the schemes of the two women. The plot twists kept it interesting, overall completely entertaining. Highly recommend if you like historical romance. Nothing steamy here, just lots of wit and humor. There are several "BEST" Heyer novels. This is one of the top five. The characters are amazing. I dearly loved both of the female main characters. The love stories were most satisfying, the mystery was scintillating, and the dialog was snappy. 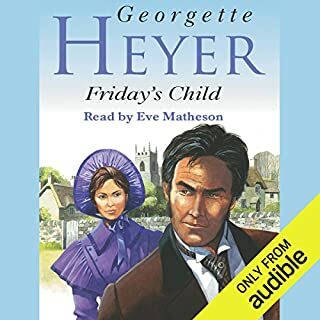 This is one of the funniest of Heyer's books, and she is known for her wit. I laughed out loud so many times! Please listen to this book. I promise you won't regret it. 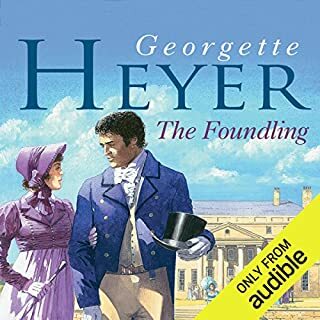 One slight warning - all of Heyer's books have a first chapter that is a tiny bit slow as she sets up the plot and the characters. It is not boring, but not much action in the first chapter. Don't let that put you off because things take off in the second chapter of her books and is totally absorbing from then to the end. Phyllida Nash is always a pleasure to listen to. An excellent reader who characterizes the different voices with humor and subtlety. This is the most enjoyable story - adventure, intrigue, humorous and a touch of romance in the wonderful setting of regency England. 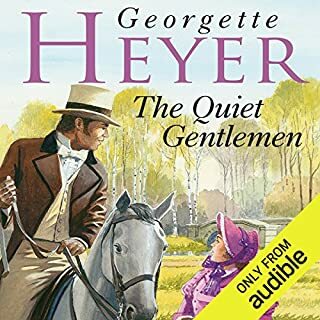 Georgette Heyer is a great read but this is one of her best! Phyllida Nash was wonderful!! Her accents were fabulous and her narrative spot on!! Thank you for hours of enjoyment! Charming, frivolous, decently written and well read. Glad I downloaded it. I was so pleased to see this in the new release list today. 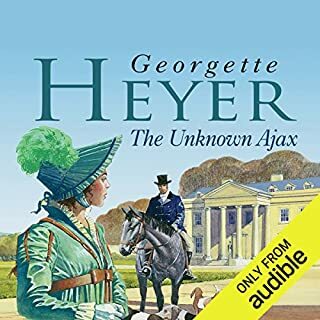 I hope this means that Audible has a release programme for Heyer and will be issuing all of them over a period of time. I would love to see Venetia, Friday's Child, The Grand Sophy, Sylvester, well all of them really. Although even better news would be to hear that some of the more poorly read ones from the old Chivers back catlogue have been re-recorded, starting with Devil's Cub, which is already on Audible's list in its original unlistenable to format! The Talisman Ring is one of my favourites. Georgette Heyer is very undemanding but should have you gently giggling from page 1. They are light, feel-good books which I save for days when I'm feeling rotten or to help me unwind when work is particularly stressful. Not everyone's cup of tea, I know, but don't mistake for cheap imitations and if you a looking for something undemanding to relax with, this one is worth a try. 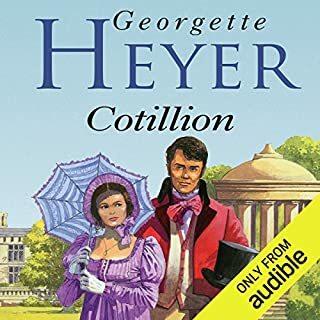 I have just finished this audio book, and it was a real treat, beautifully read and great fun. 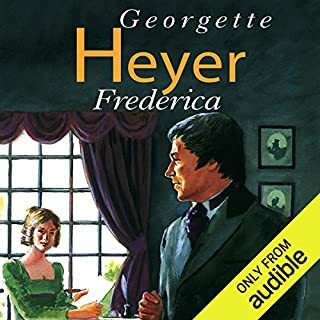 It was always one of my favourite Georgette Heyer books and this version does full justice to it. Strongly recommended if you fancy a light heated romance! 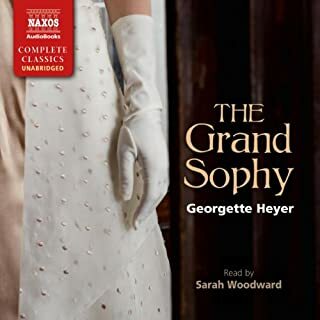 I was so pleased when I realized that Audible had Georgette Heyer in their catalogue that I immediately bought this and a couple of others. The Talisman Ring was always my favourite Heyer book - mostly for the beautifully drawn characters, witty dialogue and Regency details. Its a book that makes time fly and you are slightly disappointed to reach the end as you want it to go on. It is beautifully read by Phyllida Nash who manages to have convincing male characters, which not every female reader can do and a lovely French accent that always sounds natural.I would always recommend this for a relaxing, amusing book with a bit of a detective puzzle included. 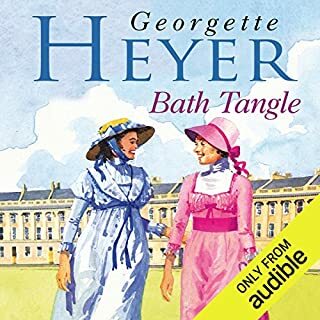 Georgette Heyer is not only wonderfully accurate on all details of the regency period but her books are such good fun. This one is no exception. The story is light-hearted but full of enough twists and turns to keep you interested to the end. The characters are delightfully attractive or wicked (as required) and the witty dialogue highly entertaining. 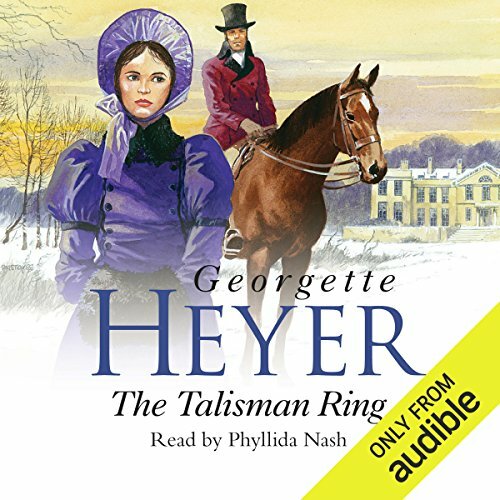 The Talisman Ring is among the best of Gerogette Heyer's novels and is beautifully read by Phyllida Nash. If you want some light listening to lift your spirits or wile away a long journey you could not do better that chose this book. Let's hope we get more of these! I was so happy to find this one in Audible! 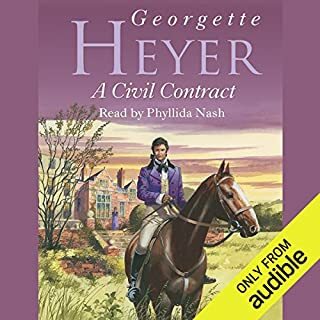 I add my pleas to those who wish to see more Georgette Heyer's books in Audible, unabridged and - if only possible - read by Phyllida Nash. There seem to be several for the USA members, let's hope they come out in the European Audible as well. 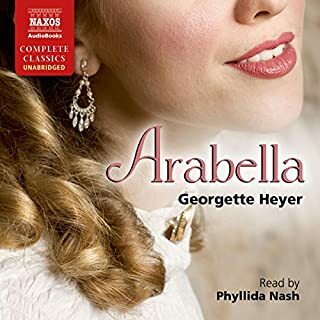 Georgette Heyer's books are light and funny and Phyllida Nash is a suberb reader. The reader was a delight to listen to. A mystery, two love stories and an interesting historical background together with some very likeable characters. no, this was the first time. She is very good. It was not a moving story, just fun! 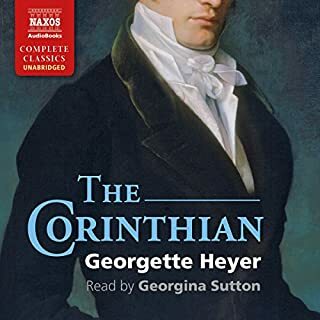 This is an excellent reading of vintage Heyer - the characters are well-realised, the humour is given full rein, and the mystery twists and turns to a satisfactory conclusion. 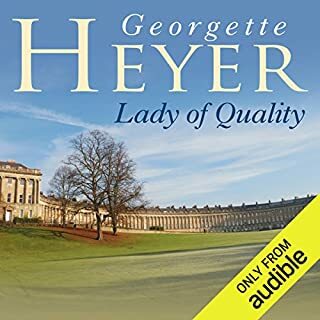 If you already love Georgette Heyer you won't be disappointed by this version, and if you are new to her novels this is a fun one to start with! Phyllida Nash reads this beautifully and pulls off the very difficult challenge of producing a convincing French accent that doesn't stray into parody. A very enjoyable listen. 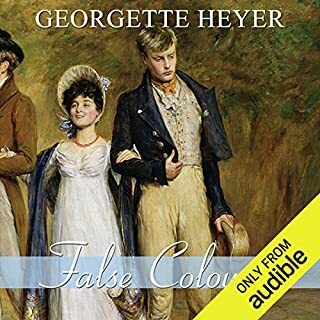 Another great book by Georgette heyer. She has so many good ones please bring some more out.